In addition to the amazing local food favorites, Grants Pass offers a wealth of year long activities and fun things to visit. Most widely known for their hair raising rides along the Rogue is Hellgate Jet Boat Excursions. Where you can ride at race-car like speeds on a jet boat just inches above the water down the scenic Rogue River and into the world famous Hellgate Canyon. Meanwhile learning about the history of area with a tour guide pointing out the local flora and fauna. If you prefer the animals up close and personal, make sure to check out the Wildlife Image Park , whose mission is Saving Wildlife (big or small). There you can experience the remarkable sanctuary and rehabilitation center and meet the animal handlers while experiencing animal up close and personal. Or if you prefer to take things a bit easier, a great choice for getting to know local vendors is to visit the Grants Pass Growers Market in the heart of downtown. Just don’t forget to bring a large bag to take home all your goodies in. The outdoor festivals, fairs and park events are not to be missed. The best times to get a sample of the Rogue Valley is when the sun is shining and the clouds are far and few between. 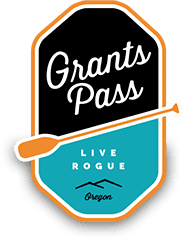 Art Along the Rogue, Amazing May, and First Friday are just some of the fantastic outdoor events to make sure and see in lovely Grants Pass. Visit Grants Pass Chamber of Commerce and the City of Grants Pass for a complete listing of events and don’t miss everything the Historic downtown has to offer.